Will you ‘Look in the Bag’ and help us reduce medicines waste? A major campaign is being launched to help reduce the staggering £7 million bill for medicines which are prescribed every year in Hertfordshire and west Essex but never used. GPs and pharmacists from across the area are working together to encourage people to consider the cost and health implications of not taking medicines as they are prescribed, or ordering medicines which are no longer needed. Research with patients and carers across the area suggests that prescription medicines are sometimes over-ordered ‘just in case’ they run out – leading to very expensive and potentially dangerous stockpiles of medicines in the home that have a limited life. Some patients are also reluctant to tell their GP surgery that they have stopped taking medicines that have been prescribed for them, which could lead to serious health problems. Patients are returning unused medicines to their pharmacy, but most don’t realise they cannot be re-used and must be destroyed – at a cost to the NHS. If a medicine is handed back to a pharmacist straight away, before the patient leaves the pharmacy, it can be recycled for another patient but once it has been taken outside the building it has to be destroyed. Medicines should never be thrown in the bin or flushed away. When you collect your prescription it’s a good idea to look in the bag before you leave the pharmacy and hand back anything you do not need. You don’t need to order a medicine every month to keep it on your repeat prescription list. "It’s really important that you or the person that you care for take the medicines that have been prescribed. If for some reason you are not, please tell a GP, pharmacist or nurse, because it could be having a serious impact on your health. If a medicine doesn’t agree with you, it might be possible to prescribe an alternative." check whether you already have more than one month’s supply of anything that you need to take regularly. 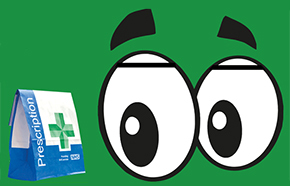 The start of the campaign will see around 300 pharmacies across Hertfordshire and west Essex helping to raise awareness by displaying campaign materials in their stores and on pharmacy bags. Posters and screens in waiting rooms in GP practices will also help get the message across. A Twitter campaign will also be highlighting medicines waste with the hashtag #lookinthebag. It’s hoped the campaign will save vital NHS resources and support patients to think more about the medicines they’re ordering and taking, and seek advice from their GP and pharmacist should they need any help. Across England, NHS and social care organisations have been encouraged to work together more closely to deliver more effective, joined-up and affordable services. The country has been divided into ‘Sustainability and Transformation Partnerships’ or ‘STP’ areas by the national organisation, NHS England. Hertfordshire and west Essex, is one of these STP areas. Photos show one of our campaign images and a photograph of medicines handed back by one of our patients. Further information available on request.